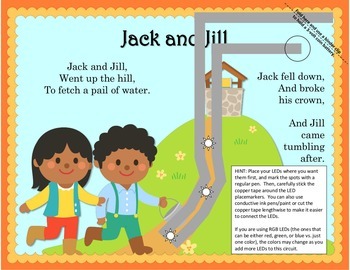 This is not a normal nursery rhyme project! 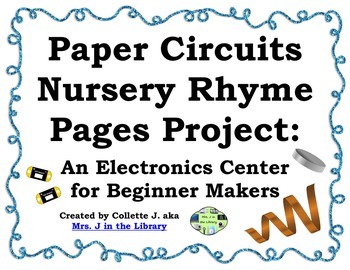 These 7 printable nursery rhymes include both the nursery rhyme pages and electronic circuit pages with instructions for teachers and students to make each page interactive using copper tape, LED lights, a beeping buzzer, and a wiggling vibration motor. Please note: This product is also available in BLACKLINE. 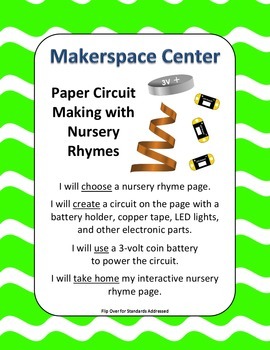 ★ As an electricity/makerspace project or center - Students can choose 1 nursery rhyme page to complete as a first makerspace project or exploratory science center. The power needed for these circuits is only one 3-volt coin battery, so there is almost no danger of getting hurt with these electronic parts, as long as your students know not to swallow them. ★ Trying your first electronics project - Learn to design and create circuits yourself using copper tape, LED lights, a piezo buzzer, a vibration motor, and a programmable micro-controller. No coding experience needed, I promise! 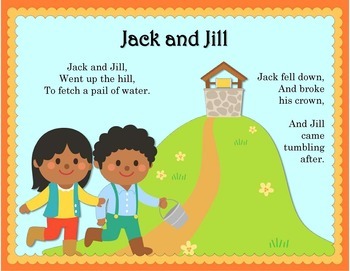 All nursery rhyme pages are in easy-to-print PDF file format. The cover pages of the nursery rhyme book are also editable in a Microsoft Word file, so you can customize the finished book if you bind the nursery rhyme pages together. Download the preview for more information and the suggested electronics materials needed to complete this project.